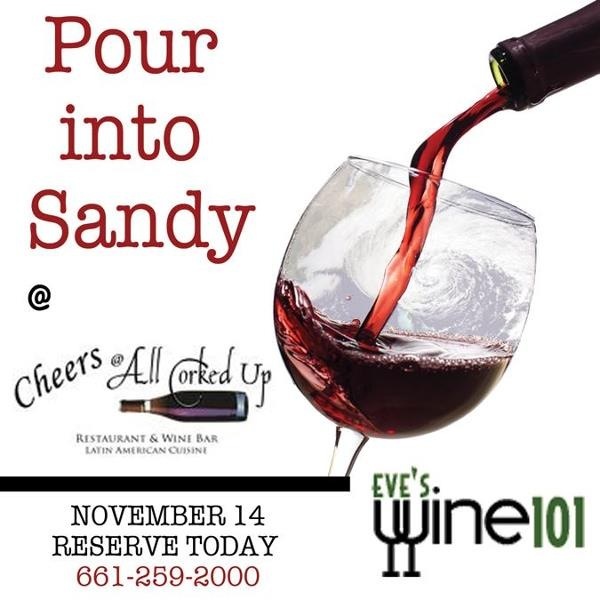 Please join us from 6-9 p.m. November 14 for a wine tasting and a silent auction fundraiser for the victims of Hurricane Sandy. Just like our “Pour Into Haiti” event, the cost is $25 cash at the door (bring a little more – or a personal check – for the auction!) and 100% goes right to the American Red Cross. Live music will be provided by “Joe Iaquinto and Friends”. This event was suggested by Eve Wine 101 editor and writer Michael Perlis (a frequent Cheers@All Corked Up customer and a locker holder! ), and organized along with Eve Bushman, Al Robles, Terri Rivera and Shelly Schutz. To attend this event, simply call to reserve a spot, or just show up! The last time we did this we had a very large crowd of very happy people. And one thing we learned from that event is that we feel much more connected to a cause when we participate in fundraising efforts that supply help.